Definition at line 19 of file ReplyHeaderStrategy.h. Implements ACLStrategy< char const *>. Definition at line 20 of file ReplyMimeType.h. References Http::CONTENT_TYPE, HttpHeader::getStr(), Http::Message::header, ACLData< M >::match(), NULL, and ACLFilledChecklist::reply. Definition at line 29 of file ReplyHeaderStrategy.h. References HttpHeader::getStr(), Http::Message::header, ACLData< M >::match(), NULL, and ACLFilledChecklist::reply. Reimplemented in ACLServerNameStrategy, and ACLDestinationDomainStrategy. Reimplemented from ACLStrategy< char const *>. Definition at line 24 of file ReplyHeaderStrategy.h. 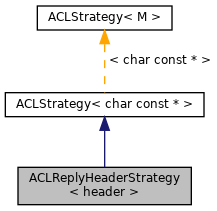 Reimplemented in ACLServerNameStrategy, ACLDestinationDomainStrategy, ACLRequestHeaderStrategy< header >, ACLUrlLoginStrategy, ACLUrlStrategy, and ACLUrlPathStrategy.